Workers and contractors are under stress every day to get work done as productively and quickly as possible so sometimes that means taking some shortcuts. That could mean the worker or contractor might whip out a mobile phone, a USB stick or a hard drive to pull files to help solve a problem. That is exactly the time when malware can enter a system and head down a destructive path. 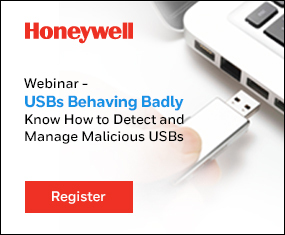 One fix to that problem is the Secure Media Exchange (SMX) launched Tuesday by Honeywell Process Solutions (HPS) that can protect facilities against USB threats, without the need for complex procedures or restrictions that impact operations or industrial personnel. That is where a second check occurs. If that hard drive had any malicious files, it could have prevented the project from starting up on time. Malware spread through USB devices by employees and contractors to patch, update and exchange data with onsite control and computer systems, was the second leading threat to these systems in 2016, according to a report from BSI publications. Uncontrolled USBs have taken power plants offline, downed turbine control workstations, infected a steel plant with Conficker. One of the issues about security is it can be onerous to users and takes up way too much time. With SMX, the user plugs the USB drive into the module and then it scans the device to look for and remove malware. When the user plugs in the USB, it has an easy to use format that lets you know what to do each step of the way. In addition, depending on the size of the drive and how many files it has, the time frame to gain system approval should not be very long. “We want it to be user friendly and easy to use,” Carpenter said. Plugging in a USB drive and finding known malicious files is one thing, but what about a Zero Day that has no known signature? Click here to view an animated video on how to use SMX.